You’ve probably heard it at home by now, that in Kindergarten we’re all about the Zones. 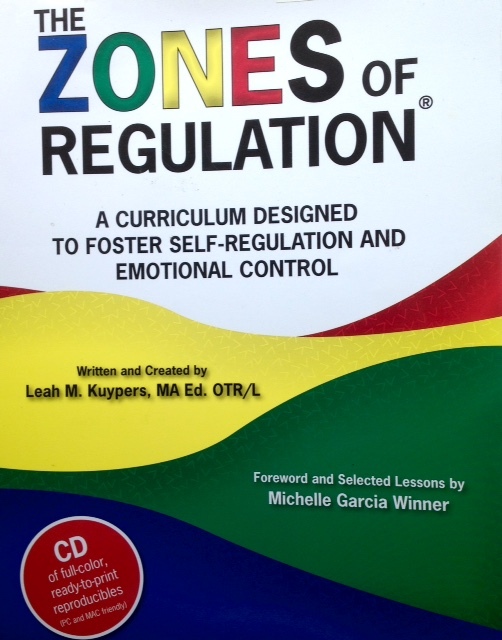 Those zones would be the “Zones of Regulation” from her excellent book, The Zones of Regulation by Leah M. Kuypers. Christy and I started using the Zones of Regulation with our students a few years ago. Briefly, it’s a curriculum on recognising one’s needs, impulses and emotional state (alertness); a classification system for feelings and emotions (the four Zones); the teaching of self-regulation skills and strategies; and the social awareness of how one’s behaviour may be seen by, and can affect, others. Self-regulation is the foundation of our Kindergarten program. Although what we do at our grade level is just an introduction, we support our children by teaching them to be aware of, and identify, their needs and emotions; accept that all emotions are present and valid; introduce and practise self-regulation skills and strategies to help them to manage their needs and emotions; and to choose appropriate social responses to the specific situation or environment (social awareness). When we’re in the green zone we are feeling calm, happy, focused, relaxed and ready to learn.When we’re in the yellow zone we are scared, excited, frustrated or getting carried away.When we’re in the red zone we are feeling very frustrated, angry and our body is out of control. When we’re in the blue zone we are feeling sad, tired or sleepy. We teach the children that all the zones are “good.” For example, you want to be excited and have energy (a higher state of alertness) when we’re on the playground or playing a sport so the yellow zone is where we want to be. If we are tired or sick (a lower level of alertness), then perhaps recognising that we need to rest and play a quiet activity would be a better choice. We are in the green zone when listening attentively at the meeting area, following teacher instructions, working on-task at our table groups, cooperating and playing well with our friends–it’s the optimal zone for learning. We always try to identify and describe green zone behaviours so the children know what those behaviours might look like and sound like. The red zone can be a bit trickier. Just because we are angry and in the red zone does not mean we are “bad;” indeed, being angry and articulating (calmly) that we are angry is ok, but it’s how we respond which is key. As parents and teachers, we need to calmly talk about our feelings and why we feel the way we do so that our children see what a socially appropriate response for a very high level of alertness and energy looks like. We teach the children that yelling, hitting, pushing and throwing things are not socially acceptable responses and that there are other strategies to navigate their way. Typically we would start identifying how a student is feeling, start a calming countdown (count backwards from 10) and then deep breathing together until words can be articulated and go from there. We actively refer to the Zones throughout the day, what we observe about the energy in the classroom or where we should be for a specific activity. The children are learning that different situations require different responses depending upon the context of the current social situation, and what should we do to get there–up-regulate or down-regulate. We might need to up-regulate our energy with an Action Break if we’re feeling tired during instruction; or down-regulate our excitement with a slow, cool drink of water if we’re returning to our classroom after playing outside. We practise a variety of self-regulation strategies in class. At the beginning of the year, we taught deep breathing as a strategy for calming, using the Breathing Ball as a visual for breathing in and breathing out. We did this first, so that the children would know how to breathe deeply down into their tummy (spine straight, in through our nose (silently), out through our mouth (silently) and keep our shoulders down). The great thing about deep breathing for calming is that you always have your breath with you. We can use this strategy when we are in line waiting to get into the gym for an Assembly or if our classroom line-up is exceptionally noisy. Another strategy we’ve added has been to listen to music, from Jazz to New Age to Classical, for calming and relaxation following the morning recess. Then, we work on our mindfulness by using the Zenergy chime to train our minds to focus and be in the present. We also incorporate deep breathing into this time as well (having prioritized the teaching and practising of this strategy in September). The children are experts as they have already had multiple opportunities to practise. One of the primary roles of the teacher is to be a model of self-regulation. Our ability to stay calm and focused, and to regulate and articulate our own emotional state, means we are better able to assist your children with regulating their optimal (green zone) state for learning. Consider taking the time for your own “self-regulatory moment.” In a busy classroom, we know it is very healthy, leaving all of us feeling energized and refreshed for the next part of the teaching day.